In Williamson County, there are numerous non-partisan local elections for city council, school board, and utility districts in May every year. Williamson County has a lot of useful information about elections on their Elections Division website. 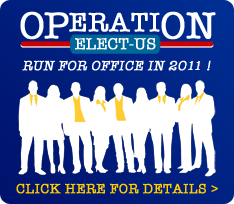 We absolutely encourage Libertarians to run for local office whenever and wherever possible. It is much easier to win local elections – the statistics prove it – than partisan November election races. It is our principal purpose as a county party to help you win your election, and we will do everything we can to help candidates run for office. As a potential candidate, we encourage you to regularly attend our county party events so that you have the opportunity to meet local Libertarian, network, and begin to build your base of support. We encourage potential candidates to begin thinking about their race one to years from the election date. We like to work together as a team, and the leadership of the WCLP would like to speak to potential candidates as soon as they start considering a possible race. The local elections are nonpartisan; you will not be running on the Libertarian ticket, but we want to help Libertarians in support of their campaigns. To do this, the state party has created the LPTX Candidate Handbook along with other forms and useful resources. Robert Butler has written a book called 18 Steps to Win a Local Election. It is a detailed step by step approach to running for local office. In even-numbered years, election for county, state, and federal offices are held. If you wish to run for state or federal office in November, you must submit an Application for Nomination form to the State Chair before the prior December deadline. If you run for a county office, the same Application for Nomination Form should be delivered to our County Chair. The Candidate’s Guide is available at the Secretary of State’s website, but some laws and other details may change for the current elections. The procedure for nominating minor party candidates by convention is governed by Chapter 181 of the Texas Election Code. Id. § 181.001. To be considered for nomination by a convention, a candidate, for an office other than president and vice-president of the United States, must make an application for nomination. Id. § 181.031(a). The application must be filed no later than 5:00 p.m. on January 2 preceding the minor party’s convention Id. § 181.033. Candidates seeking nomination for a state or district office must file with the state party chair. Id. § 181.032(a)(1). Candidates for county or precinct offices must file applications with the county party chair. Id. § 181.032(a)(2). The state and county chairs must file a list of candidates with the Secretary of State not later than 10 days after the filing deadline. We nominate by convention and must hold the following conventions: precinct conventions on the second Tuesday in March, Id. §§ 174.022, 41.007; county conventions on the first Saturday after the second Tuesday in March, Id. § 181.061(c); district conventions on the second Saturday after the second Tuesday in March, Id. § 181.061(b); and state conventions on the second Saturday in June, Id. § 181.061(a). The chair of each convention will certify the nominees to the county clerk/elections administrator (county or precinct offices) or the Secretary of State (district or statewide offices) not later than 20 days after each corresponding convention. Id. § 181.068. Under Title 15 of the Election Code, candidates must file campaign contribution and expenditure reports. For further information and all questions about such disclosure filings, campaign finance, and political advertising, please contact the Texas Ethics Commission at 201 E. 14th, 10th Floor, Austin, Texas 78701 (or call toll-free at 1-800-325-8506. Candidates filing for federal offices should contact the Federal Elections Commission toll-free at 1-800-424-9530. For those who are not running for office – a request from the volunteers who make up the officers and representatives serving on the State Libertarian Executive Committee, and our other volunteers who serve as staff: If you are not already a monthly donor, please donate (button at top right of this page) to help our cause. We need your financial support now, as we begin our work in preparation for candidate support for the upcoming elections.